Be sure to view Steve Stevens' trip across the US for Habitat For Humanity. He completed his ride beating the former record by 4 days! The link is below. On his twelfth day, Dave Walker and I went up to ride with Steve to encourage him on. That was my last long ride on the Boneshaker. That's where I had my accident on I-80. Steve found me on the road unconscious and bleeding. He doesn't mention the accident on his web page as he didn't want to worry his family. There is a link to an MP3 of his message he left for Barbara on our answering machine in the links below. You can read the whole story of his ride on the Canberra Bicycle Museum link below. Since then I have a new bike, a Kennedy made in 1992, and it's sweet. The animated gif above is me mounting the bike at Steve Steven's house in Golden. The pictures on either side are at the Kennedy Ballfield in Denver. 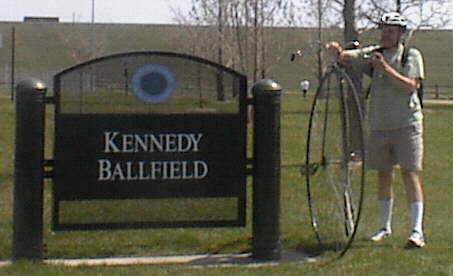 The ballfield is about 20 miles from my house, and makes a very nice ride along Cherry Creek to get there. I used to play softball at these fields about 15 years ago. Our team was "The Fighting Rastafarians", and we 100% defeated. Never won a game! 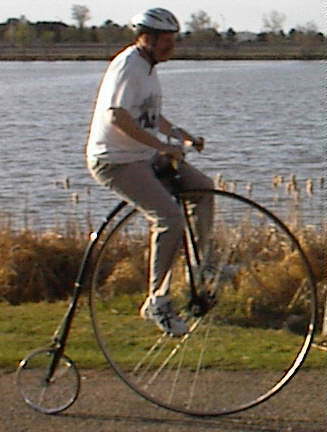 The picture above is of the first High Wheel bike I ever rode, the Boneshaker mentioned above. This bike gave me so much trouble before it tried to kill me, that I have nicknamed it the Brainshaker. After the accident, I sent back the front forks to the factory. They called very concerned about my well being. They sold me a new front fork for $100.00. These new front forks were completely redesigned, and felt much more solid. 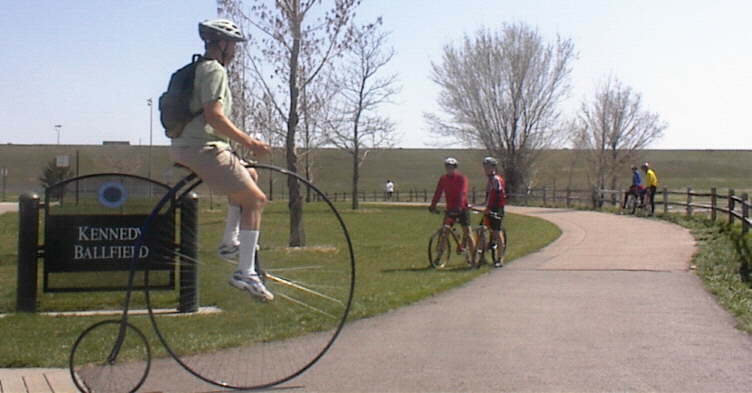 I rode it just once or twice in the park to be certain of it's ridability and it rode completely different, much more solid. I did sell it after warning the buyer that it's not a bike for setting records, just for show, parades, and tootling around the park. As you can see comparing the two pictures, the Boneshaker isn't that great for show. The woman I was with during all this time stood by me through all the troubles when I wasn't certain that I would recover from this accident. We were married on Januray First, 2001. The wedding pictures are linked in the box below, and include some more high wheeling pictures. To prepare for the Wheelmen meet in Buffalo, NY, I decided to go see a baseball game in Colorado Springs. I thought the distance to be about 70. 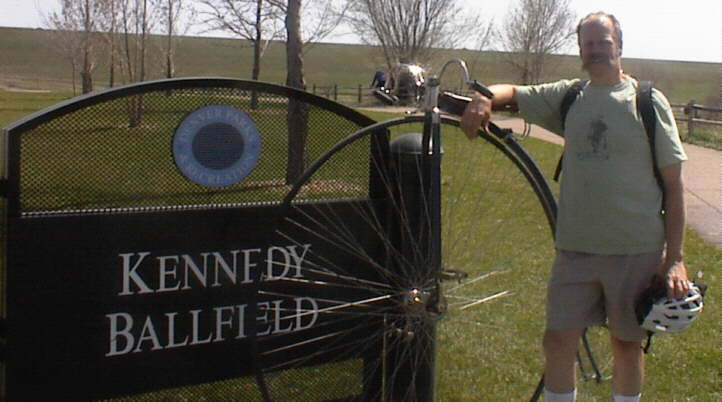 It wasn't until I arrived at the Sky Sox stadium that we had the final total of 82 miles. 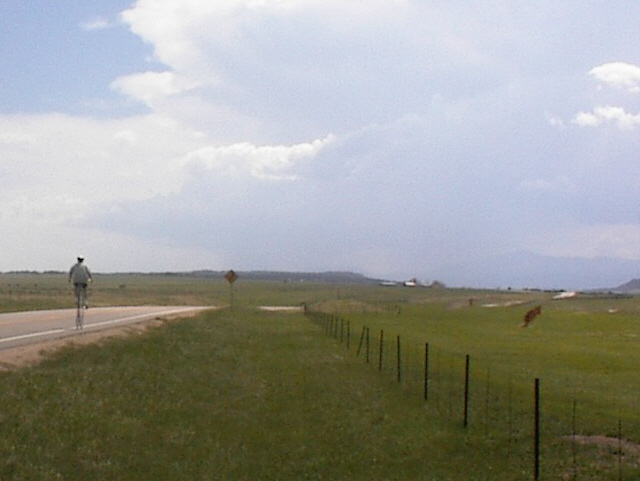 It took close to 10 hours, and required some walking where the road was narrow, steep, and a steady level of traffic as we approached Colorado Springs. All in all, the motorists were friendly, even on a two lane 65 MPH road without shoulders. The picture on the left shows me near the summit of Monument pass, a relatively easy pass, but still close to 7000 feet in elevation. 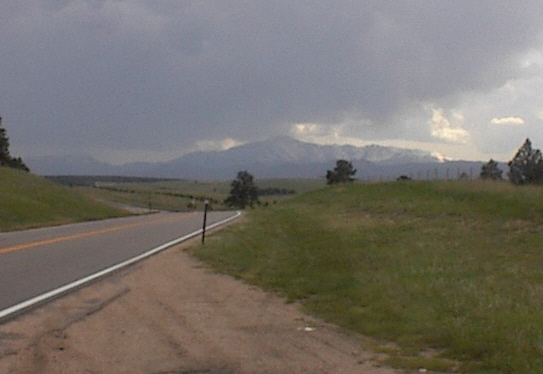 The one on the right is a view of Pike's Peak. You can barely see me just beyond the bend in the road. Arriving at the stadium, one person asked "Didn't I see you in Parker?" On Saturday, May 12, the Sox began a 4-game set with Omaha Golden Spikes with a 11-4 victory at Sky Sox Stadium. Even though I was involved in getting major league in Denver, I still prefer the feel of the minor league games. Made with Notepad, with the aid of Wilbur.